The 2016 Richard Tucker Foundation winner, Jamie Barton. The Richard Tucker Music Foundation was formed in 1975, two years after the great tenor's death. Its purpose has always been to provide financial support and exposure through its concerts to the best of young American classically trained singers. The Foundation offers career grants to pay for study, and the top Richard Tucker Award carries a $50,000.00 prize. In addition to the financial benefits, the Richard Tucker Prize has been called the Heisman Trophy of Music Awards. Aprile Millo (1985) Renee Fleming (1990) Deborah Voigt (1992) David Daniels (1997) Joyce DiDonato (2002) Lawrence Brownlee (2006) and Michael Fabiano (2014). The 2016 Gala, which will be shown Friday night, celebrates the 2016 Tucker Award Winner Jamie Barton. Ms. Barton won the Cardiff Singer of the World Prize in 2013. Most recently she has been at the Metropolitan Opera, Richard Tucker's artistic home for thirty years, as Adalgisa in Norma and Giovanna Seymour in Anna Bolena. The 2016 Gala is called From Bocelli to Barton. 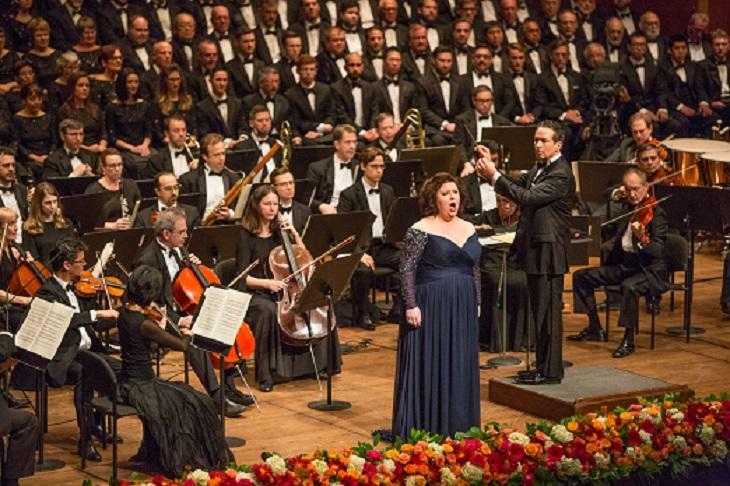 The guest list includes Deborah Voigt, Steven Costello, Andrea Bocelli, Renee Fleming and the Metropolitan Opera Orchestra and chorus conducted by Eugene Kohn. I saw Richard Tucker (1913-1976) twice. No tenor was more celebrated or more loved. He was a short, thick-set former cantor who worked in the garment district, and he had a voice without equal and the brains to make it last. He was not young when I heard him, but I don't remember a false or badly placed note. If you listen to his broadcasts going back to the 1940s, his singing was consistently fine and filled with squillo. His son Barry Tucker has called the young artists supported by the Foundation his father's legacy. Come to the banquet! Friday night at 9:00 PM on WOSU TV.